This probably doesn’t surprise you. Toddlers are curious about their world. They explore by touching things and putting them in their mouth. They will try to copy what they see adults do; squeeze the spray bottle of cleaner or take medicine. The products usually involved are the ones commonly found in the house. What may surprise you is how many children under the age of 1 year are involved in poisoning exposures. In 2016, there were 114,147 calls to U.S. poison centers about them and 3 children died. In recognition of National Poison Prevention Week, March 18th – 24th, I would like to share with you some things I have learned from taking calls at the PCC. I hope my observations and suggestions will help you keep your infant safe from an accidental poisoning. 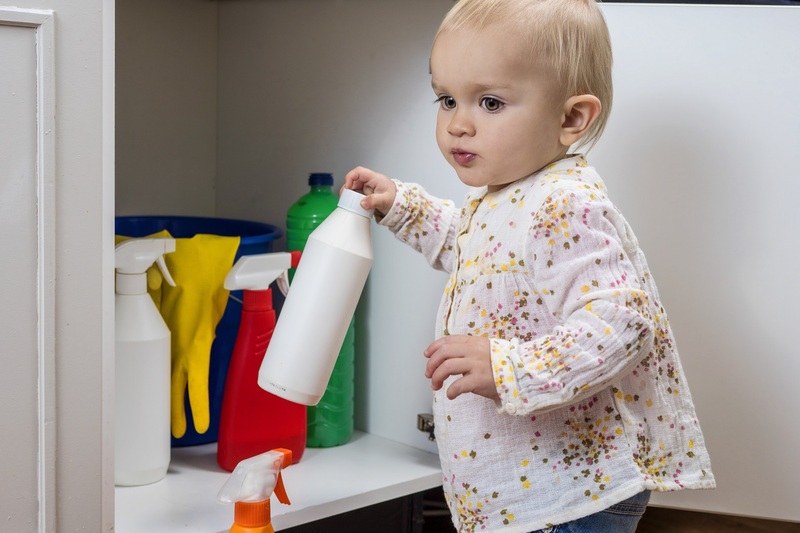 Poisonings often occur when the caretaker is distracted by another task or another child requires attention even for just a few seconds. Beware any time you have house guests or you are visiting another home. Adults who aren’t used to having children in the house forget how curious they are and how quickly they get into things. Elderly relatives may have poor eyesight or difficulty using their hands which contributes to them dropping things like pills or hearing aid batteries. They may store medicine in unsecured pill boxes. Don’t be lulled into thinking your infant isn’t at risk just because they aren’t crawling yet. Babies may grab any item within reach. I’ve taken many calls about infant exposures during a diaper change from items stored on the changing table. The adult is right there but their hands are full and their attention is on the diaper change. The baby is usually on his or her back and so tilts the product above his or her face to bring it to the mouth. This results in the product pouring out onto the baby’s face where it may land in the mouth, the eye, or get inhaled through the nose. Items commonly involved include diaper creams, hand sanitizers, or baby powder. Hand sanitizers are dangerous because of the high amount of alcohol in them and powders, especially those with talc, are dangerous if inhaled into the lungs. Another common scenario is the infant secured in his or her car seat who gets into the open purse or diaper bag that was placed on the seat beside them while the parent is driving. I’ve heard many parents say, “My other children were never like this! She is into everything.” Assume every child is at risk. Pills rattling around inside a container may make a similar sound to a rattle but a pill container should NEVER be given to an infant or child to play with. Given enough time they will get the lid off. Have the Poison Control Center’s phone number ready. Make sure anyone who cares for your baby has the number too. In the U.S. the number is 800 222-1222. Or text “POISON” to 797979 to store contact information on your smartphone. Centers are open 24 hours a day, 7 days a week. You will be connected to the nearest center according to the area code of the phone you are calling from. Do not rely on safety caps as the only way to prevent children from getting into medicines or household products. There is no such thing as a “child proof” cap. The proper term is “child resistant” and it is meant to slow a child’s access not prevent it. Scan your child’s environment from their point of view. It will help you identify potential poisoning or other safety hazards. Reevaluate with each new developmental milestone your child reaches. Keep medicines and household chemicals or cleaners locked up or out of reach. Never refer to a child’s medicine as candy to get them to take it. David D. Gummin, James B. Mowry, Daniel A. Spyker, Daniel E. Brooks, Michael O. Fraser & William Banner (2017) 2016 Annual Report of the American Association of Poison Control Centers’ National Poison Data System (NPDS): 34th Annual Report, Clinical Toxicology, 55:10, 1072-1254. The Placental Portal: Sharing cells with your baby – forever? !